This article submitted by Linda Stelling and Lynne Jacobson on 6/21/00. Under sunny skies, the Peepers Family Picnic was held Sunday afternoon at the Gazebo Park. On Father's Day, dads took time to play games and miniature golf with their children in the park. Other popular activities included face painting, karaoke, and a balloon toss for the younger children. The cost of the meal at the picnic was an item for the Paynesville FoodShelf. More than 650 pounds of food was received. 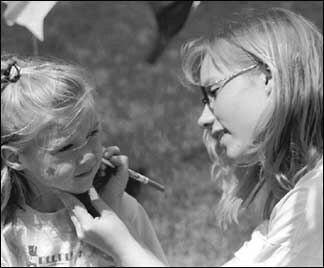 The games were managed by the Miss Paynesville queen contestants: Tammy Christensen, Trista Dukowitz (painting faces at the picnic), Ginni Lahr, Kari Frank, Katrina Orbeck, Rebecca Werlinger, Heidi Wilder, and Jana Zumwalde. 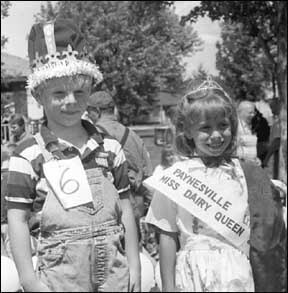 The queen candidates also served as judges for the Little Miss Dairy Queen and Dennis the Menace Look-a-Like contest. On hand to crown her successor was Jackie Skoglund, 1999 Little Miss Dairy Queen. Judy Nietfeld served as the emcee for the contest. She asked each of the contestants what they like to do for fun and what they want to be when they grow up. Each contestant also was asked to name their brothers and sisters and tell about their pets. Crowned Little Miss Dairy Queen was Andrea Schlangen, daughter of Dale and Julie Schlangen. Other contestants were: Jessica Stransky, Natalie Whitcomb, Brittney Hemmesch, Bailey Gray, Trista Thompson, McKenna Evans, Amanda Fenske, Mariah Schwandt, Abby Johnson, and Breanna Hess. Crowned Dennis the Menace Look-a-Like was Brian Braegelmann son of Brian and Theresa Braegelmann. Vying for the title of Dennis The Menace Look-a-Like were: Patrick Latcham, Tyler Cromwell, Dustin Thompson, Benjamin Youngs, Luke Orbeck, Trey Stanger, Josh Bungum, Logan Lahr, and Matthew Spanier. The R.O.S.E. Center and the Paynesville Area Center sponosred a dance and light supper Saturday evening as the opening event this year's celebration. Approximately 75 people attendd the event - enjoying supper, fellowship, and the music that followed. Wally Pickle entertained the crowd with dance and listening music. 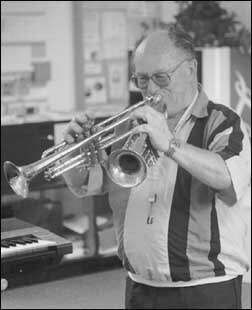 He played the saxophone, organ, and his signature, two trumpets at one time. Pickle had a band in years past playing at many area dance halls so he was familiar to many in the audience.